The 100% natural filtered Estonian peat body mask guarantees a relaxing procedure and results in clean, silky-smooth skin. Peat is a pearl of nature, a well-kept secret that can work wonders on the body. 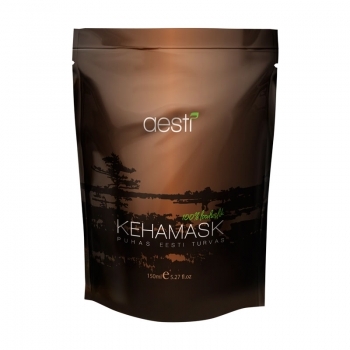 The Aesti Body Mask rejuvenates the freshness of the skin and leaves the user feeling relaxed and calm. The Mask helps the skin become silky-smooth, glowing with vitality and youthful elasticity. Further, the minerals in peat get absorbed into the skin cells during the procedure and help ease any painful tensions in the body. The product suits all skin types, balancing moisture levels throughout the different skin layers. The Aesti peat body mask is also well-suited for people suffering from any thyroid problems and for whom seaweed or mud procedures are usually not recommended. The Body Mask is not recommended for pregnant or breastfeeding mothers. Preheat the mask to around 40 degrees Celsius in a bowl of water. Exfoliate the skin lightly beforehand. Apply the mask to the skin in a roughly even layer (using approximately 150g in total per procedure). Cover the body with a film and warm blanket. Let the mask work its magic for 20 minutes. Wash off the mask with clean warm water. After the procedure, we recommend drinking plenty of water and relaxing for at least 30 minutes. Use the mask 1-2 times a week. INGREDIENTS: 100% filtered balneological peat.